A year ago on Thursday, the world held its collective breath as a European spacecraft dropped a tiny robot lab onto the surface of a comet hurtling towards the Sun. The 12 months since that bumpy landing have yielded many exciting scientific finds, and more than a little drama, as Philae intermittently phoned home from its alien host between long bouts of sleep. Now, after four months without word, perched on comet 67P/Churyumov-Gerasimenko, ground controllers are hoping for a last chance to make contact and even do some science before the lander finally runs out of steam. “We hope to resume a series of scientific operations with Philae in the coming weeks,” lander scientist Jean-Pierre Bibring told AFP. Assuming the lab’s instruments are working and its solar panels tilted at the right angle, “we could have several contacts with the robot beginning this week” and instruct it to run experiments, possibly even the drill it has not yet successfully deployed. Conditions will be best in the period from the end of November to the beginning of December, scientists say. Philae touched down on 67P on November 12 last year after a 10-year, 6.5-billion-kilometre (four-billion-mile) journey through space, piggybacking on European mothership Rosetta, now orbiting the comet. The landing was bumpy—the washing machine-sized lab bounced several times on the craggy surface before ending up at an angle in deep shade, deprived of battery-replenishing sunlight. 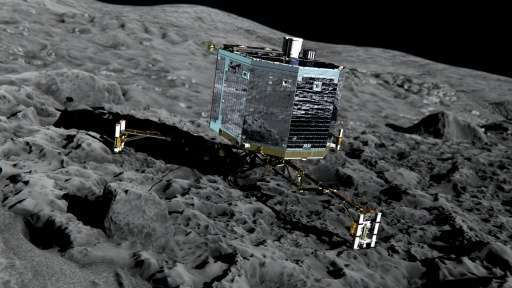 Philae sent home data from about 60 hours of comet sniffing and prodding with eight of its 10 instruments, before going into standby mode on November 15, 2014. The lander’s power pack was recharged as 67P drew closer to the Sun on its elliptical orbit, and Philae woke up on June 13, to great excitement on Earth. It made eight intermittent contacts, uploading data, only to fall silent again on July 9.